Dr Lovemore - Play slot machines right now! 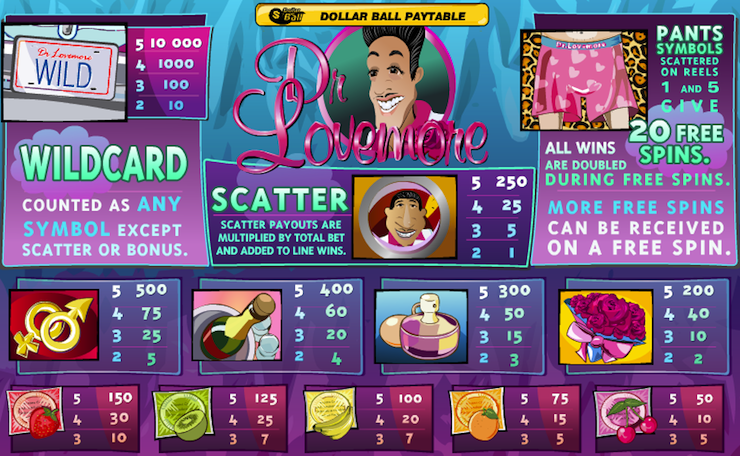 Dr Lovemore is a video slot game that will bring you all the aphrodisiacs for a night of game loving. Themed around hot nights this 5 reel, 20 payline game offers a wild card, scatter wins and free spins. If you are playing for real money you have the option to play for the progressive Dollar Ball jackpot. All you need to do is enable it and hope your “love” numbers match the jackpot ones. Dr Lovemore offers you the chance to play for the Dollar Ball progressive jackpot if you are playing for real money at one of the casinos. All you need to do is click on the Enable button just below the Dollar Ball jackpot sign. You then chose five numbers or the game can pick them for you at random. Clicking on Activate will confirm your selection of numbers. Every time you play a round of the slot game, the drawn number will appear just above your chosen numbers. Every time a number matches your selection a win amount will be paid out to you. The jackpot is yours when all your numbers match the ones drawn. You can disable the jackpot game at any time. Dr Lovemore offers a wild card in the game that will stand in for any symbol except for the scatter and the bonus. This helps you chances of putting together a winning combination. The scatter symbol wins in the game are multiplied by total bet and added to line wins. The Pants symbol scattered in reels one and five will reward you with 20 free spins.